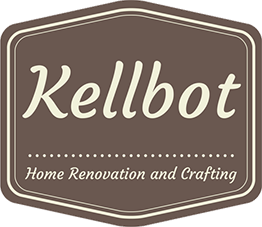 How I Tidy Craft Supplies and Hobby Stuff - Kellbot! | Kellbot! One of the most daunting tasks in my quest to KonMari my house is dealing with my incredible collection of hobby stuff / supplies. I have a lot of hobbies, and many of them have a lot of stuff that goes with them. Some of this stuff has taken a lot of time/money to acquire, so I have to be smart with how I purge and sort it if I don’t want to be filled with regret down the line. 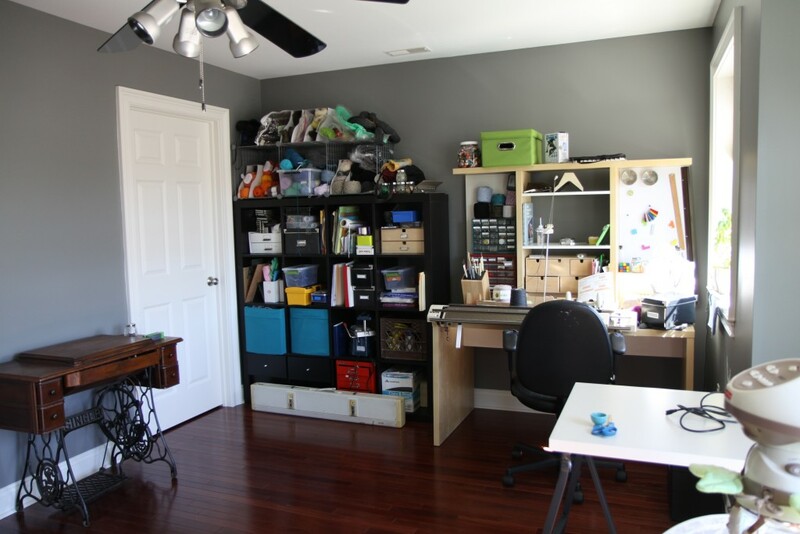 This is what my office looks like clean, or at least it did as of a couple years ago. No one has ever actually seen this since then. Hand knitting. I do this regularly. My yarn stash takes up a ton of space and needs pruning, but otherwise I am perfectly OK with it taking up ~15 cubic feet of shelf space. Machine knitting. I haven’t done this in a while but would love to get back into it when I have more time. It takes up a bunch of space, but the machines are rare. I also have multiple, and I think it’s time to prune the collection down to my one favorite machine (my Superba). Reclaiming yarn from thrift store sweaters. Nice in theory, not really worth the time. Probably not gonna do it again. Should just pitch the half-unraveled sweaters. Easy to get more if I change my mind. Photography. I go through phases of this every few years. Equipment is expensive, takes up little space. Definitely going to hold onto most if not all of it. Embroidery. I do this occasionally, but I have a disproportionate large stash of threads and tools, none of which are rare or expensive. Need to cull it back to something reasonable. Exercise. I do this regularly, but I’ve had my dad’s rowing machine for more than a year and have used it maybe twice. Time to return it and focus on weight training. Camping. I do this once or twice a year and plan to continue doing so in the future. The camping equipment definitely needs pruning though, some of it I’ve had since Girl Scouts and haven’t used since then. Hydroponic gardening. I haven’t done this since my daughter was born but would like to in the future. The equipment is not cheap and took a while to accumulate as it’s mostly only available through mail order. So that stuff is largely staying. Painting. Nope. Not gonna do it again. Goodbye, paints. I know I’m never going to need them again. I went online to see what they cost new. $50 each. Not inexpensive, but not out of the realm of replacing if somewhere down the line I do suddenly really need to form silver or copper into hemispherical shapes. But when I’m totally honest with myself I know that’s not going to happen. I took a deep breath and put them on the “go” pile. Figuring out what to do with the stuff I’m unloading is also hard. A lot of it does still have use/value, but it’s not the sort of stuff that does well at a thrift store. It needs context. For the things that are more valuable I’m trying Craigslist. Some of the jewelry equipment I plan to donate to my university’s program. I ended up throwing out a lot of odds and ends that really aren’t likely to be useful to anyone, like Plexiglas forming dies I made in college. Here’s a panorama of my office in a more natural state. Except I finally threw out the dead cactus in the window. Having cleared the hurdle of my most loved tools, I’m looking forward to a few easy categories as a pallet cleanse. In general I prefer that to Kondo’s suggested order of increasing emotional difficulty. I like to do something hard and then go do one that’s brain dead and satisfying. Leona’s closet is great for this, she’s constantly wearing out and outgrowing clothing. I can feel quite accomplished just by throwing out all her pants with holes in the knees. Or I’ll go back through one of the giant boxes of baby clothes (many of which were hand-me-downs Leona never even wore) and cull it down to a reasonable size. The good new is that despite being emotionally exhausting it really doesn’t take that long. I went through my tools in maybe half an hour, while I was taking a break from a frustrating problem at work. So far I’ve taken 5 bags full of stuff to the local thrift store, and I’ll probably have more to go by next week. Over time I get better at being honest with myself about whether or not I’ll actually use something again. Sometimes when I revisit categories I’ve already done I find a few more items to yank. Hopefully by the end of the year I’ll be surrounded by only stuff I need or enjoy, not clutter I resent.